Discovered at South Wilton, Wiltshire, UK, 15 June 2015. Namaste, I send you love, light and much healing. My name is Suzanna Maria Emmanuel and I have been designated by the Great Divine to be the Ascension Channel for SOVEREIGN LORD EMMANUEL THE GREAT and also for CAEAYARON (KRYON) as they, the Divine, desire to bring millions and millions into the love collectively to awaken mankind and to bring the frequencies of peace and love to our planet. Always throughout time there have been great struggles in the universe. If we think star beings don't exist and that we are the only ones in existence, well, we would be proven time and time again that our thinking was wrong, for here again once more, this message to us is showing the struggles and the many battles in the universes over sovereignty. A long, long time ago it was questioned by the star beings of great resistance if the star light beings in the love and the light were not being kept prisoners by the Divine as they, the star light beings, upheld the Cosmic Laws to be in the peace and love. The resistant universes were universes of independence, control and power. They did not believe in the Cosmic Laws of love and peace. They believed that the Cosmic Laws were working against true freedom. They imprisoned many beings in the universe and wanted more and more control and power. In the greater Divine courts, it is so that when something is raised that is what must be answered, so it was agreed by the Divine Courts to answer this question to prove that the love universes were more powerful than all the resistance, and that true freedom was the way of love and peace. The battles began because many of the darker, resistant planets wanted the intelligence and the power of the light planets. Many light star beings sadly began to believe that the resistance had more power and intelligence. This is why multitudes of light star beings sided with the darker star beings and thus killed many of their own star families of love and light in the battles. This is how the greatest universal battles began between the planets who had no love and the planets who had love and were in the light but now were fighting to keep love. They fought and fought, head on, for many, many, tens and tens of thousands of years without a winner as shown in the image also. Here you see the light side fighting for survival and the resistance side fighting for control and power as shown by the brown spear. The numbers of the resistance were far greater than the side of the light star beings as more and more fell to the darkness, however, the power of the light was always much stronger as they have love force. Hence there was no winner. To settle the game as to who was stronger, as the star light beings were tired of fighting, planet earth came into existence to settle the questions once and for all. To find out more about the great battles and why earth came into existence, please listen to this following teaching by CAEAYARON (KRYON), who explains the galactic wars in the universe. The brown side represents the great resistance. Their spear looks more threatening than the other side as they used methods far from the ways of love. They forgot the love in their hearts. They are far removed from the love. 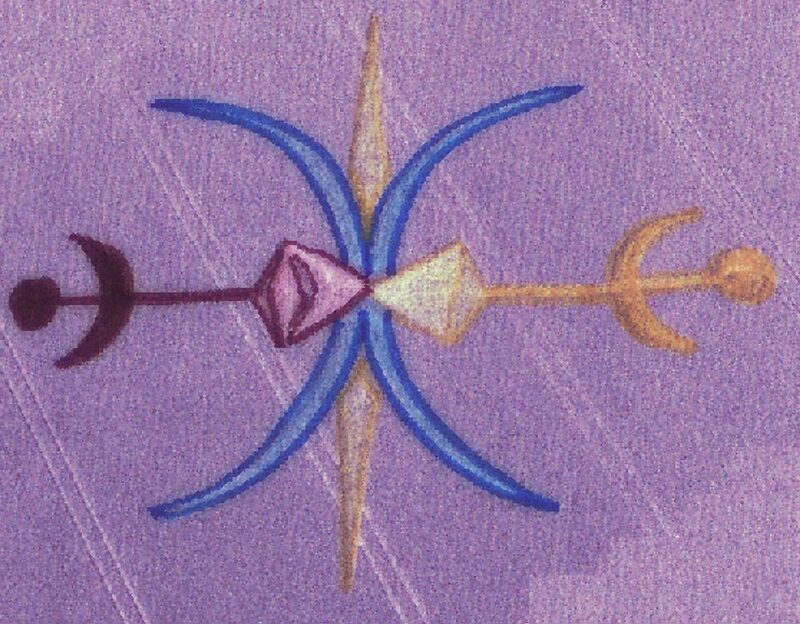 The yellow side represents the star beings in the light. Many of the star light beings also chose to go to the side of the resistance sadly and became known as ‘fallen star beings,’ because they believed that the great resistance had greater power than them. The blue shapes in the centre are the fight for power. The yellow represents sovereignty. The beings of resistance wanted the power to control all the universe. They wanted absolute rulership of the universe. The beings of love and light fought against them as they wanted their love planets protected and wanted the Divine to keep its sovereignty as the Divine is the only rightful one to have sovereign power as all came into existence because of the Great Divine. This is why we, as people, always need to stay in the greatest forgiveness for all that has happened, to allow ourselves to come into a greater state of peace and come into the deep love and truly step into the love flows. In this way, we will have proven that love is the greatest way to live and the battles in the universe and also on our planet will truly stop. Please watch the teachings from CAEAYARON to understand Divine Purpose.